Soba Noodle Bowl w/ Hot Sesame Chicken — Happy Food Co.
PLACE the chicken breast tenders on the baking sheet and season to taste with salt and pepper. COOK for 10-15 minutes or until cooked through (no pink inside). 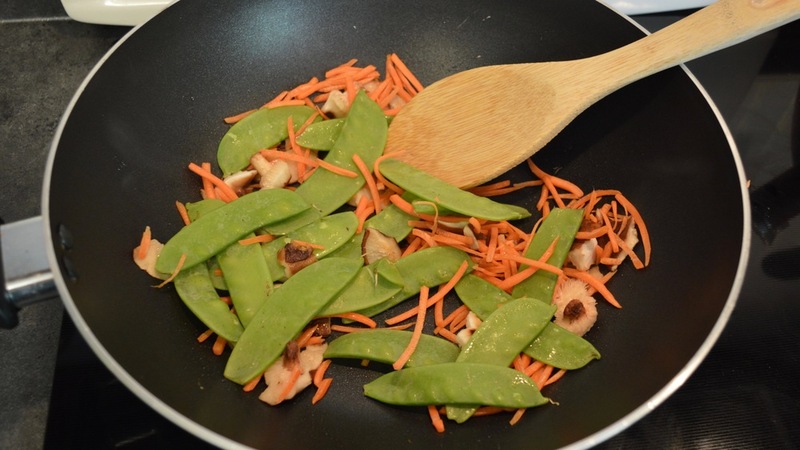 WARM the peanut oil in a large skillet or stir-fry pan over medium-high heat. ADD the shiitake mushrooms and sauté for 3 minutes. ADD the carrots, snow peas and soba noodles. STIR and cook until the veggies are crisp-tender and the noodles are heated through, about 3-5 minutes. SLICE the cooked chicken into bite-sized pieces on cutting board. DRIZZLE the chicken with hot sesame sauce and toss to coat. ★TIP: If you prefer a "soupier" noodle bowl, you can warm up some chicken or vegetable broth from your pantry and add it before serving. SPOON the noodles and veggies into serving bowls. TOP with desired amount of chicken, green onion, sesame seeds and arugula. DRIZZLE with rice wine dressing and serve with fortune cookies on the side!